This beautiful spacious home is a total of 2,688 sq. feet.of ocean views and sea breezes. It sits about 50 yards from the Caribbean Sea and is on the largest stretch of beach in the Cancun hotel zone. The villa is located on the grounds of the Omni, a five-star hotel. Upon entering the villa you escape to paradise. There is a full cooking kitchen and dining area that seats 10. A mirrored bar for enjoying cocktails, and a step down living room. The living room has lots of comfy seating and couches along with a 50' television to watch your favorite shows and sports. There is an expansive outdoor patio for dining and relaxing. It overlooks the swimming pools and you can walk right out for a swim. The 2nd floor has the Master Suite has a large bathroom that includes double sinks and a walk in shower. The master has it's own private balcony overlooking the 3 swimming pools, beach and crashing waves of the ocean. There is also a double bedroom on the 2nd floor with two queen beds and a bathroom with walk in shower. Also a terrace to lounge on. Between the two bedrooms on the second floor there is a queen size futon for additional sleeping. On 3rd floor(the Penthouse) there is three queen beds and a bathroom with double sinks and walk in shower. There is a tremendous patio in the penthouse overlooking the entire hotel. Take in the swimming pools, beach and ocean. The penthouse patio is complete with lounge chairs and a table and chairs for you to enjoy the breezes and relaxing. *Tulum (Mayan ruins near the ocean) about 1 1/2 hours away. *Chichen Itza (Maya Ruins) about 1 hour away. *Xcaret (swim with the dolphins and terrific night show). *Xelha, Beautiful water park great for snorkeling. *Isla Mujures (Island of the Women) beautiful ferry ride. *Playa Del Carmen (Cruise ship port) very 70's Bohemian. *Cozumel (great for snorkeling) take the ferry from Playa. *Fishing excursions daily, the right basin is nearby. *Cenotes, Exquisite Natural Underground Sinkholes and rivers located about 1 1/2 hours away. I AM A BEACH LOVER. CANCUN HAS BEEN MY DESTINATION OF CHOICE FOR OVER 30 YEARS. THE WATER IS MAGNIFICENT AND THE SAND IS SO WHITE AND COOL ON YOUR FEET. WE LIVE HERE SIX MONTHS OF THE YEAR AND ALWAYS ON HAND IF YOU NEED ANYTHING. I HAVE TRAVELED THE WORLD AND BY STAYING AT THE OMNI HOTEL I DISCOVERED MY LOVE OF STAYING AT A VILLA WITH FAMILY AND FRIENDS. THAT'S WHY I PURCHASED MY VILLA 20 YEARS AGO AND LIKE TO SHARE IT WITH THE VACATIONERS WHO ARE LOOKING FOR A HOME TO STAY IN. THE OMNI IS SITUATED IN THE MIDDLE OF THE HOTEL ZONE. IT IS A BEAUTIFUL SETTING THAT IS WELL MAINTAINED. THERE ARE 3 SWIMMING POOLS AND 2 HOT TUBS. ONE OF THE HOT TUBS IS ON THE BEACH AND IT IS SO MUCH FUN. WE HAVE THE LARGEST BEACH IN CANCUN AND YOU CAN WALK FOR MILES. I HAVE AN OUTSTANDING CHEF THAT WILL COOK BREAKFAST, LUNCH AND DINNER FOR YOU FOR $120 A DAY PLUS FOOD. HIS FOOD IS EXQUISITE. HE IS ABLE TO COOK SO MANY CUISINES. HE COMES WITH HIS SON AND THEY WILL COOK THAI, CHINESE, JAPANESE, ITALIAN, FRENCH, MEXICAN AND EVEN AMERICAN. HIS ROAST TURKEY, LOBSTER BISQUE, CHOCOLATE MOUSSE ARE SUPERB. HE BUYS ALL THE FOOD FOR THE MENUS YOU PLAN, MOSTLY ORGANIC. THE ONLY THING YOU HAVE TO WORRY ABOUT IS BRINGING THE WINE TO DINNER. OR BRING IT TO LUNCH AND DINE ON OUR BEAUTIFUL TERRACE OVERLOOKING THE POOL. toilet, shower, 2 Sinks, Make Up Table, Italian Shower With 6 Jets Showers. toilet, shower, 2 Sinks, Toilet Shower, Radio, 6 Jets Shower made in Italy. WE HAVE THE MOST BEAUTIFUL AND LARGEST BEACH IN CANCUN. THE VIEWS FROM THE VILLA IS EXCEPTIONAL. 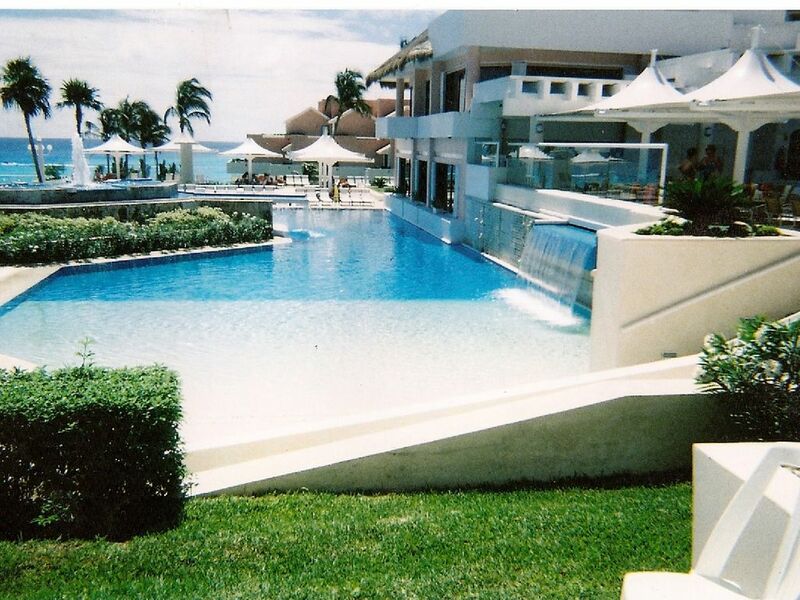 WE SIT ON THE CARIBBEAN SEA.YOU CAN SEE 3 SWIMMING POOLS, THE BEACH AND OCEAN FROM THE PATIOS . A/C THROUGHOUT WITH FANS IN EVERY ROOM. TELL HOUSEKEEPER TO CONTINUALLY CHANGE. EVERYTHING YOU NEED IN THE KITCHEN. CHEF PROVIDED AT AN ADDITIONAL COST. TELEVISION IN EVERY BEDROOM. ALSO IN LIVING ROOM (SMART TV) NETFLEX AVAILABLE. PATIO IN LIVING ROOM AND EACH OF THE BEDROOMS. We now have the largest beach in Cancun! WiFi throughout the Villa. Local Telephone free. Cold water dispenser & beach towels available. Our concierge Fana will take care of your transportation, activities and chef needs. Absolutely everything we asked for! I don’t know where to begin with the accolades of positive comments I have in my heart amd memory bank. This house is filled with love, run my a amazing team of humans that really care and assist whenever asked, and sometimes when not asked. Marilyn has created a magical space and we are so fortunate to have had our wedding there. We had 8 of our closest family and friends, on the beach. It was wonderful to have us all under the same roof, we definitely bonded and are closer for it. Martin, our chef, prepared the most delicious cuisine, you can taste the love in his food. Ines is a lovely housekeeper, with a smile that would light up the darkest of rooms. Everything in the house was clean and comfortable. The resort was nice, we were able to go into the pools, walk freely among the resort and beach access was minutes away from our porch. We ordered our own bar of alcoholic delights, and played bartender ourselves. We didn’t miss the “all inclusive” experience- we just walked into our kitchen and made our own drinks. Marilyn has plenty of beautiful pool friendly chalices for your spirits, and they are allowed throughout the resort. The resort is on the busline and only 8-10 minute taxi into Cancun Excitement like Coco bongo night club where Jim Carry’s movie “The Mask”, was filmed. Plenty of shopping and sightseeing. The resort does have “vending” evenings where local vendors come in with their treats to sell. Be mindful that many of the finds offered are available in town at a much lower price. The tile painter is one of a kind artist and a great treat to bring home. Overall we were treated with royal standards and with kindness. We will never forget this trip and look forward to coming back! Just returned from a fantastic time at Maralyn’s villa. It was perfect for our group of three families of 11 people, with enough room to accommodate more as there were pull out sofas that we did not use and a couple of beds could have fit another person. Our beds were comfy, the villa was well maintained, very clean and spacious. It’s location on the resort was perfect, only steps away from the pool and the beach. Maralyn was also an absolute pleasure to deal with! Fana was very friendly, helpful and available for all of our needs. He arranged our transportation to/from the airport, to the Tulum Ruins, and Cenotes excursions. He also arranged our parasailing as well as a personal chef and daily housekeeping (includes laundry)! Chef Martin was amazing, a definite highlight of our stay. When we arrived he had dinner started and had picked up groceries that we had requested for our stay. His food was fantastic, everything made from scratch and very delicious! His homemade chips, guacamole and sauces were incredible. The rate of $120 USD/day for 2 or 3 meals was very reasonable (cost of groceries extra). Definitely a better decision than an all-inclusive or eating out. Overall it was a great family experience and have nothing bad to say. I would recommend Maralyn's villa and it's services for any large group! SORRY I DIDN'T HAVE A CHANCE TO WRITE YOU SOONER. YOU AND YOUR FAMILY WERE AMAZING!!! I AM SO HAPPY THAT YOU HAD A WONDERFUL STAY IN MY VILLA. THANK YOU FOR ALL THE GRACIOUS COMMENTS ABOUT YOUR STAY AND MY TEAM. YOU ARE SO KIND. IT WAS ABSOLUTE DELIGHT TO GET TO KNOW YOU AND HAVE YOUR FAMILY SPEND THE HOLIDAYS IN MY VILLA. YOU ARE WELCOME BACK ANYTIME! This was our family's first experience with non-all inclusive accommodations in Mexico and it felt risky. How would we eat? How would we drink? Where are the grocery stores? We don't speak Spanish! It all worked out just perfectly and the vacation was great. After sending our deposit to Maralyn, she passed along contact information for Fana our local concierge. Fana was great. Fana arranged our airport transports, deep sea fishing trip, daily chef, daily maid service, scuba and offered to help with more but we wanted to try somethings on our own. Before leaving, we sent Fana a grocery list of things we wanted in the frig. We arrived at the resort and Fana was waiting for us to let us into the villa. In the villa, we found Chef Augustine cutting up tomatoes and avocados and making fresh tortilla chips! Amazing. The rest of the trip was just as great. VILLA - Great location in the resort. 3 separate bedrooms. Clean especially with Ines taking care of the place. She would arrive around 10am and clean until 3 or 4pm each day except Sunday. She also helped us with laundry. The Omni is an a great location as well. Across the main street there is a small pharmacy and grocery store. The city bus stops right out front and one comes by every minute or so. Our only complaint about the Omni (nothing to do with our villa) is the smoking policy which apparently is that smokers can smoke anywhere. ACTIVITIES - As mentioned previously, Fana setup our deep sea fishing and scuba through AquaWorld. We caught 2 sailfish and 4 bonitos. Chef Augustine cooked up our bonito the day we caught them. We spent a day at Explor and loved it. Omni is a major resort so all exclusions make a stop for pickup/drop off. FINAL WORDS - Loved it. When we come back to Cancun, we'll book again. We just returned from a fantastic time at Maralyn's villa. It was very clean with wonderful prompt service from Fana and the maid. The villa has great access to the beach and the pool. We utilized the airport pick up and drop off service and it made our trip very smooth. We would highly recommend staying at this villa. A few tips about the area: Taxi service to get around was $20-$30 USD one way so the bus is much more affordable. We are not accustomed to buses, but we never had to wait and the drivers were very helpful. Look for restaurants off the beaten path. They were great and extremely affordable. Just returned from a 4 night girls trip to Maralyn's villa. We had 9 women and had plenty of room to be alone or in the group. The villa is much nicer than described - very spacious, nicely updated. There is a private terrace on each floor with incredible views. Three bedrooms with a total of 6 beds plus a futon (that the housekeeper outfitted with bedding) was great for our large group. The bathrooms and bedrooms were large enough for all of us to get ready for the evening at the same time, comfortably. The towels were replaced each day and pool towels are available from the hotel. The hotel pool was literally steps from our patios - no need to even use the front door! That's what makes this place unique....no waiting for elevators and walking 20 minutes to the beach and pool. Its all steps away! The hotel amenities were nice, but the hotel itself was a little "tired" could use some updating. We rented a cabana on the beach one day and it was wonderful. You have the play the "towel game" a bit and get your towels on the chairs pretty early to have a place to sit - but even with a group of 9, we had no problems. We hired the chef that Maralyn recommended and wanted to bring him home. He shopped and prepared breakfast and lunch (we went out for dinner) each day and had lunch waiting when we arrived - fish tacos, fresh guacamole/salsa, chips and all the fixings. Just talk with him about what you'd like (he makes it all!) Everything was made from scratch - sauces were incredible and he even fried his own chips for us. Nothing like waking up to fresh squeezed orange juice and the table set for breakfast each day. The downside to this, of course, is that you can't get poolside service or order things ala carte from the hotel at the pool and beach. We didn't mind. The all-inclusive option was ~ $100/day per person. We spent a fraction of that hiring the chef. The housekeeper, Judy and the concierge, Fana, were accessible and easy to work with. I sent a grocery list and the villa was perfectly stocked when we arrived - beer, wine, soda, etc. There is a large water cooler there with filtered water that we used for coffee, etc. No need for a million water bottles. In all, it was a fantastic trip. One suggestion I would make to Maralyn is the update the description! Let everyone know that you can offer a chef, hotel transfers, stocking, etc. at a very affordable price! We will return! We just returned from a ten day visit to Maralyn's villa and truly enjoyed ourselves. The condo is ideally situated within the Omni Resort development as it overlooks two pools with the ocean just a few steps beyond. The unit has an outdoor patio fronting this same direction and was our favorite gathering spot for morning coffee or evening refreshments! The accommodations are well appointed, equipped and very clean. Our stay included daily housekeeping by Judy who was fantastic and Fana, Maralyn's property manager, was available to us for any of our needs from arranging transportation to and from the airport, restaurant and sightseeing recommendations, etc. We did not hire the chef as others have but only because we like doing our own cooking and also went out to eat many evenings. The Resort is very well maintained, grounds meticulously manicured and safe (they had professional property personnel positioned in various locations at different times of the day checking to be certain you were guests as you entered the grounds). There were always enough chaise lounges by the pool(s) although you had to claim your spot early in the day if you wanted one on the beach. No surprise though because the ocean water was warm (heavy undertow so beware) and the sand soft. It's easy to find all types of shells, small & large, if that is one of your interests. We knew renting Maralyn's place did not include the ability to eat at the hotel's restaurants or get poolside/beach beverage service and we did not find it to be a problem at all as the villa is always only a few steps away. Due to our own curiosity, however, we inquired with the hotel if we could "buy" daily passes for food & beverage (including alcohol) and were told we could. They gave us several options which included the range of $45 - $85/day per person (from 9 am - 6 pm). If one couple from our group was willing to attend a one and one-half hour presentation (to sell us timeshares? ), the rate was $45 pp per day; if no one was willing to do this (and we weren't), the rate was $85 pp per day. The resort has a nice fitness center and there was no charge to use it. We took full advantage of that amenity! It was a great trip and we would highly recommend staying here. Hope you have the opportunity to experience it yourself - you won't be disappointed. The Villa is located at the Omni Hotel in the Hotel Zone. We can provide transportation to and from the airport. All activities can be arranged through our concierge. Our concierge can stock the fridge with all of your requests as far as food and beverages including alcohol. We have a full kitchen and can provide a gourmet chef for $120 a day plus the cost of the food who will cook you and your family breakfast, lunch and dinner. You have full use of the pools and beach. We include daily housekeeping. The Omni hotel will not allow access to their restaurants for all villas.